In peak season more than 100,000 Chicago residents use the Lakeview Trail on a daily basis. Those who live along the trail are familiar with the seemingly overnight increase in traffic that occurs when the temperatures rise above 40 degrees in the spring. Those on foot know they have to keep their head on a swivel for cyclists, or at least the attentive one’s do. That problem, however, is being rectified in the form of two different paths for cyclists and runners. “Running along the lakefront is perhaps the most scenic, exhilarating experience any Chicago runner can have. 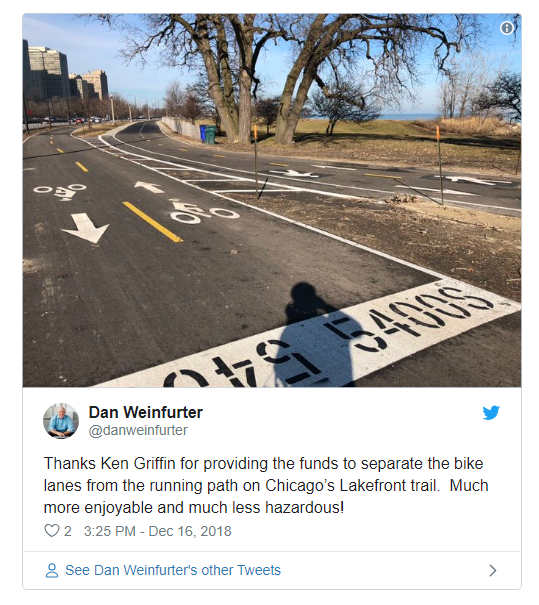 Thanks to Ken Griffin, that experience is now enhanced not only for runners but cyclists, walkers, people with strollers and others,” said Chicago Park District General Superintendent Michael Kelly in an article on Curbed about the expansion. If you prefer to enjoy your Lakeview Trail at more of a leisurely stroll than in the form of exercise (no judgement here) you can do so without worrying about bikes. Sometimes it pays off to have a billionaire in the city to help make a running trail. The Field Museum in Chicago might have felt a little empty if you’ve visited recently. Sue, the massive T. Rex that has called the museum’s Great Hall home for the past 18 years, is back in the building after a long hiatus for maintenance. Not only is Chicago’s largest mascot back, she has some new digs. An upgraded suite has been in the works for more than a year and is meant to more accurately display what Sue — the largest, most complete T. rex found — looked like. Not to mention an enhancement of her surroundings to help show what the world the dinosaur inhabited looked liked. A statement was released according to an article on blockclubchicago.org about the museum. “This is the biggest, scariest and most impressive Sue’s ever looked,” said Field Museum President Richard Lariviere. Sue is basically getting hooked up with a “Pimp My Ride” level glow up, with undercarriage lights to help showcase the different parts of the dinosaur from new angles. This will give museum visitors a better idea of the kinds of injuries Sue could have sustained. Additionally, the bones have been rearranged to change her stance, to more effectively show off in her new 5,100 square foot suite. Stop by the museum to catch up with a (really) old friend, the exhibit is now open at the Field Museum website. At the risk of being meta, I suppose we have to cover the Chicago Tribune’s coverage of the ten most popular Google searches made by Chicagoans in 2018. If you’ve kept up with the Trends Scoreboard over the year, you’ll recognize some familiar faces and names. Number one on the list was predictably about sports, but not one of the normal teams you’re used to hearing about. 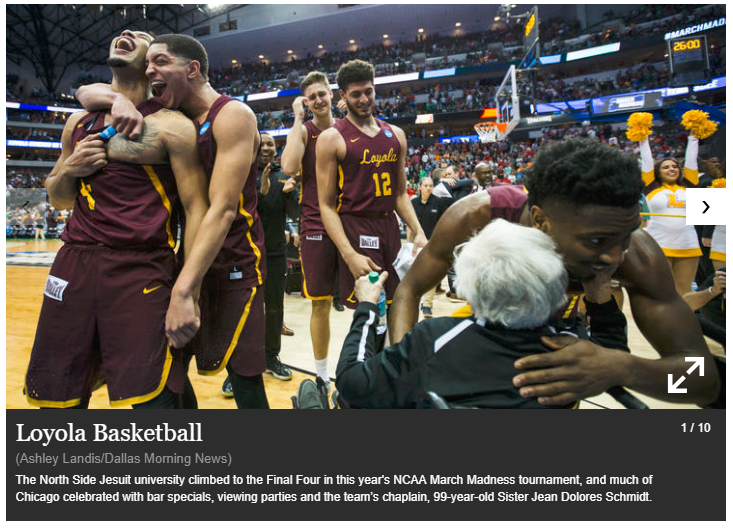 Loyola Chicago’s stunning run through to the Final Four in the 2018 NCAA Men’s Basketball tournament was the talk of the town, thanks in large part to team chaplain and pseudo mascot – Sister Jean Dolores Schmidt. While “Sister Jean” and the now-familiar maroon and gold scarves made history in ‘18, Chicago natives turned to Google to learn more about where the phenomenon started. The remaining Top 10 Searches list paints a picture of the things Chicago natives love the most about the city, from casual and fine dining to entertainment. Aire Ancient Baths: Located in River West, Aire Ancient Baths offers relaxation in the form of thermal baths, ancient rituals and a variety of massages. Gibsons Restaurant: Hear the name Gibsons, and nothing but beef comes to mind. The restaurant’s tagline is “THE Chicago Steakhouse”. Chicago Dog: Because Chicago-style is the only style. Whether Googlers wanted to drool over a picture or win the argument that there is, in fact, no ketchup allowed on a true Chicago-style hotdog, the classic culinary treat made this year’s top 10. Happy Place Pop-Up Installment: The traveling pop-up installation of 13 rooms was designed to up your Instagram game. The immersive exhibit was chock-full of quirky features, including a 20-foot-tall double rainbow. ‘Chicago P.D.’: Whether you love the show — or love to hate it — people turned to Google this year to find out why longtime cast member Sofia Bush decided to leave the NBC drama. Proxi Restaurant: The Randolph Street restaurant opened in summer 2018, serving up small plates of international street food, such as a Thai chili spread and Mexican chocolate semifreddo. ‘Black Ink Crew, Chicago’ on VH1: The VH1 show came to Chicago this year, focusing on a tattoo shop in Pilsen that brings together various artists. 29 Rooms Pop Up Museum: Yet another pop-up graced the Windy Cindy this year, offering visitors a chance to become part of the art. For example, guests could write down thoughts on paper and shred them in a pasta-maker. Tao Bar & Restaurant: Tao made a splash this year as one of Chicago’s newest nightclubs. Several celebrities and athletes attended the opening night festivities at the Asian-inspired space with soaring ceilings. Google tracks the trends that we the consumer want to know about it, then they give us the relevant details and a single button to click and make a reservation.